The trend away from state-funded epics to privately sponsored blockbusters means films are targeted more at teens than adults. Tom Stoppard and Joe Wright’s Anna Karenina possess a quality that most Tolstoy worshippers lack – absolute freedom when it comes to interpreting Tolstoy’s masterpiece. Wright’s bold decision to show Russian society as a giant endless theatre, where people obediently perform the parts allocated to them, materializes the tempest of emotions and thoughts that the book evokes in its readers rather than the simple plot of the novel. The cast of the film is impeccable. Turning life into a theatrical performance and a story of families in which “everything was in confusion” into a universal problem, Wright sees no need to look for typically “Russian” characters and, for this reason, appears closer to Russian reality than his predecessors did. Why are Tolstoy’s novels popular in the West? The theatrical expressiveness of Keira Knightley (Anna), Jude Law (Karenin), Aaron Taylor-Johnson (Vronsky) and Domhnall Gleeson (Levin), however conventional the decor, is fascinatingly natural and unique, setting a new standard. As such, it easily surpasses all of the Anna Karenina adaptations I know. 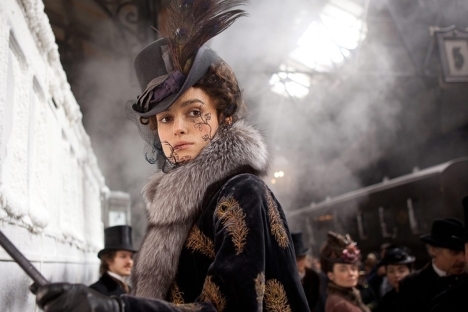 This superlative Anna Karenina hit UK cinemas back in September, but it will not be released in Russia until January 2013. Such a long quarantine for a film made in the West is unusual in Russia: Moscow premieres often precede the premieres in New York and London. The reason for this delay, I imagine, has to do with serious qualms on the part of the film’s Russian distributors: Will a movie with such a modest name attract viewers? The distributors are probably hoping that after the Christmas holiday the young multiplex crowd will become curious; they’ll want to see the film mainly because it stars Keira Knightley. As far as these kids are concerned, Keira Knightley is more popular in Russia than Anna Karenina. Russian film producer Sergei Solovyov, made two film adaptations of Anna Karenina, one for cinema and the other for TV. Despite a star cast, including Oleg Yankovsky (Karenin) and Aleksandr Abdulov (Oblonsky), neither adaptation ever made it to the screen. Solovyov's Anna Karenina took 10 years to produce, and was the first Russian film to fall victim to the economic crisis of the 90s. Then, the producers were counting on the novel’s popularity for its success, but there were endless delays due to funding shortages. Director Maurice Maître produced the first silent film version of Anna Karenina in 1911 starring Moscow theatre actors. The film has not survived and little is known about it. In 1914, Vladimir Gardin directed a new adaptation, inviting Maria Germanova, a star of the Moscow Art Theatre, to play the title role. The film was slammed by critics. Russian film-makers returned to Tolstoy seriously only in 1953, when Tatyana Lukashevich filmed a theatrical performance at Moscow Art Theatre with Alla Tarasova playing the leading role. The black-and-white picture became a box-office hit.The first colour adaptation of the novel, produced by Alexander Zarkhi at Mosfilm in 1967, stirred public interest again. Tatyana Samoylova played Anna, while Bolshoi prima ballerina Maya Plisetskaya starred as Betsy. Seven years later, Plisetskaya played Anna in the ballet by Rodion Shchedrin.In 2006, interest had waned again and the new adaptation by Sergei Solovyov, starring Tatyana Drubich and Russian film icons Oleg Yankovsky and Alexander Abdulov, received only private screenings – the distributors thought the film had no commercial future. The director, who was accustomed to state financing, had to master the new profession of asking for money from “new Russians”. “A man promised me money – then didn’t give it. So the picture was again held up,” Solovyov explained to me during filming. “What if we were to poison her,” I suggested. “It might make for a new reading of the novel. . .” The money was eventually found and Anna was able to throw herself under a train. A decade after going into pre-production, Solovyov’s film was finally ready in 2006. But by then Russian audiences seemed to have no idea who Anna Karenina was. Sergei Solovyov was not simply popular – he was a cult figure. His rebellious films of the 80s anticipated Gorbachev’s perestroika. The song We Want Change by Soviet rock star Viktor Tsoi in Solovyov’s 1987 film Assa was like a thunderclap for thousands upon thousands of young people; it heralded a new generation with a hitherto impossible fund of social energy. He exaggerates, of course: Tolstoy is part of the reading programme in Russian high schools. But the traditional Russian need for serious literature as a means of better understanding one’s own life seems to be disappearing. Where literature and film used to be a sort of school of life, today they are looked to primarily as a source of entertainment. This process began later in Russia than in many other countries, but once it began, it quickly assumed monstrously hypertrophied features: teenagers go to see blockbusters, and movie releases are aimed mostly at teenagers. Meanwhile, many adults have stopped going to the cinema altogether, since movies no longer contain enough sustenance for the mind or heart. The mass media are so focused on teenagers that they have almost stopped reacting to signal Russian films, although they do give a lot of attention to world-famous movie stars. The result is a vicious circle with service-orientated film industry and mass media dumbing down and lowering the level of their audience.